Note: The site is currently under construction. If you are interested in any of the pieces shown here, or would like to commission your own one-of-a-kind piece, please e-mail cate@atomiccate.com. Thank you! 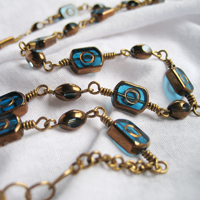 Bohemian, hippy-chic, Gypsy, whatever you want to call it, this free-flowing 27" long necklace glows in coppery-gold and aqua. 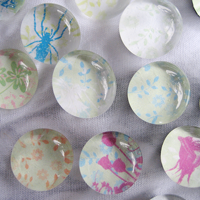 Springtime colours and patterns magnified by 3/4" glass pebbles make delightful adornments for your refrigerator, bulletin board, filing cabinet… or wherever! Available in magnets or pushpins. 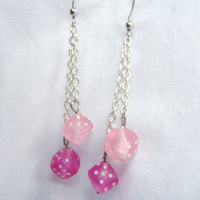 Adorable dice dangle from silver chain in two shades of pink. Simple, elegant and fun, they’re great for everyday, but stylish enough for evening wear, too! 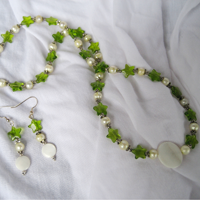 Green stars alternate with REAL freshwater pearls along this 23" necklace. A single flat shell creates the glowing disc of the moon. With matching earrings.